The CFIA, in cooperation with Toronto-based Whole Foods Market, has announced an allergy alert and a product recall against certain dairy-free bakery items from Whole Foods Market. The said products are believed to contain milk. Milk is common allergen that has not been declared in the products’ packaging. As a food allergen, milk (in all its forms) can trigger allergy attacks to people who are hypersensitive to it. Sometimes an allergy attack can lead to complications and become serious medical emergencies which can even lead to death. To date however, no allergy attacks or any medical emergencies related to the recalled bakery products have been reported. 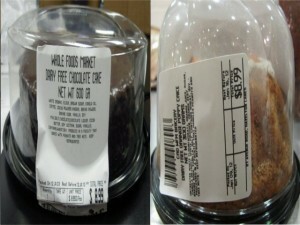 While Whole Foods Market is implementing the recall, the CFIA is monitoring to make sure that the recall is effective. Consumers allergic to milk, in any of its forms, are advised to not consume the product and discard it in order to avoid allergy attacks. Consumers who have no allergies to milk can consume the product without having to worry about an allergy attack. For more information about the recall or the recalled bakery products, consumers can call the CFIA at 1-800-442-2342 0r 1-800-465-7735. The hotline is open on weekdays, from 8 AM until 8 PM.